King of Skin by Lush is a solid bar body butter that is packed with bananas, oatmilk, avocados, essential oils and butters to help nourish and re-hydrate the skin. Banana's have a natural emollient whilst avocado's provide nourishment for the skin. Oatmilk acts as an antihistamine and the cocoa butter helps the skin to feel really soft and conditioned. It is shaped like a crown and is pale yellow in colour. 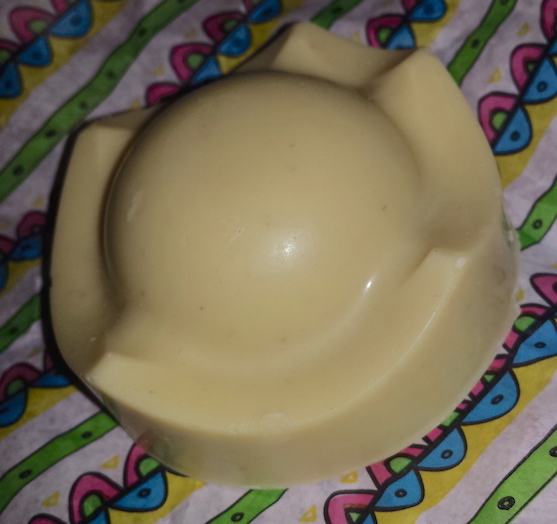 It also has the scent of cocoa-buttery bananas! If you are a frequent reader of the blog, you may be thinking "another Lush post!?" at this point. Admittedly I have been on a bit of a rekindled Lush hype recently, but there is more about this product and to this review than a little bit of hype. 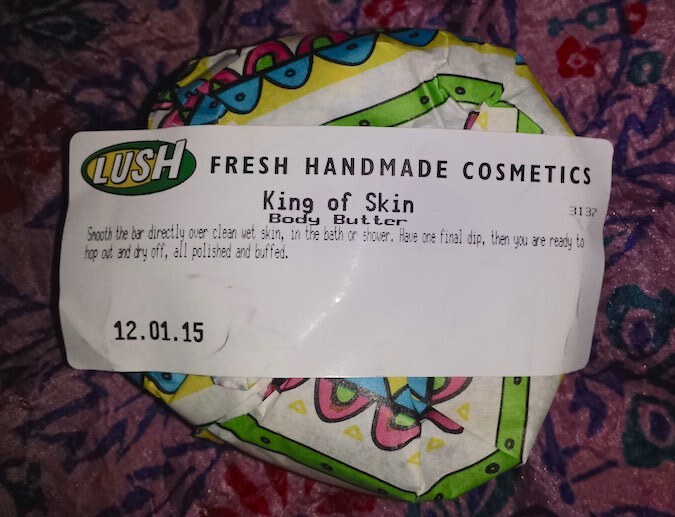 King of Skin has been one of my favourite Lush products since the day that I first tried it a few years ago. If anybody ever asks me what Lush products to try, I always suggest this one. Therefore, today's review is going to explain exactly why. King of Skin is a little different to apply in comparison to other body moisturisers. When you reach the end of your shower or bath, you need to rub the bar onto wet skin and massage in. It will feel quite oily rather than creamy. Next you need to have a quick, final rinse underneath the shower or one last dip in the tub and you're done. Usually I cut chunks from a solid Lush product (like a bar soap) to help it last longer and to make it easier to use, but with King of Skin I don't recommend it. Trying to cut it will usually result in it crumbling which will waste a lot more than letting it all get wet at once. It will also make a bit of a mess! I originally purchased King of Skin a few years back when I had horrible dry and itchy skin on my legs. I tried a few things to stop it, but King of Skin was my miracle cure (there seems to be a trend with Lush products becoming my miracle cure, see my Lush Movis review and Perioral Dermatitis post). Since then, it has been a huge love of mine that never fails to save the day. One of the first things that you may notice about King of Skin upon application is that it can make the skin a bit greasy. I find that this can be countered in a couple of ways and it doesn't end up being a problem. Firstly, make sure that you are using it on wet skin and rinsing afterwards. If this doesn't work though, another option is to simply use less. However, this may not be ideal if you have really dry skin as you will likely want that extra moisture. What I personally tend to do is to gently dab the skin with a towel after rinsing to absorb any excess product. This means that you can use enough product to provide enough moisture but highly reduce the greasy feeling that you may otherwise get. The results once dry are soft, glowing, smooth and sweet banana smelling skin. It also cuts out the need to use a body lotion too as this is your moisturiser, just applied in a different way. Another great thing is that it also cuts your "getting ready" time down a bit as I personally find this far faster to apply than a lotion post-shower or bath. I have also found that during pregnancy when the skin can become itchy (particularly on the stomach) this product can really help, especially when used in conjunction with a great bump butter such as Neal’s Yard Remedies Mothers Balm. Therefore if you are suffering with itchy skin during pregnancy, I recommend this product (and the Mothers Balm) wholeheartedly! Otherwise, if you are simply looking for a great day-to-day moisturiser or if you are suffering with dry or itchy skin, King of Skin is a fantastic product to check out. The only downside that I can think of with this product is that it can be easy to use it all up very quickly! For me though I think that this is because the smell is quite addictive. You can purchase 75g of King of Skin for £5.75 from Lush. What do you think of King of Skin? What are your favourite Lush products?